Mr Ghosn, who denies any wrongdoing, was recently released on bail after 108 days in custody. Tokyo prosecutors entered Mr Ghosn's residence before 06:00 local time on Thursday (21:00 GMT Wednesday) and took him to their office on suspicion he had misappropriated Nissan funds for personal use, Japanese broadcaster NHK reported. Mr Ghosn's lawyer said it was almost unheard of to arrest someone after being released on bail. "I am innocent of the groundless charges and accusations against me," Mr Ghosn said in a statement released by his representatives. He said the arrest was "part of another attempt by some individuals at Nissan to silence me by misleading the prosecutors". Prosecutors said Mr Ghosn's latest arrest related to transfers of Nissan funds totalling $15m between 2015 and 2018. Mr Ghosn denies any wrongdoing. He was released on $9m (£6.8m) bail in March. The auto executive also said on Wednesday on a newly created Twitter account that he was planning a press conference on 11 April "to tell the truth about what's happening". The latest arrest comes after Renault publicly criticised its former star executive for the first time, accusing him of "questionable and concealed practices". 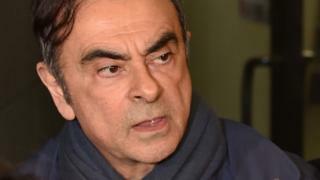 But on Wednesday, it piled pressure on Mr Ghosn when it accused him of "violations of the group's ethical principles". The carmaker said it would stop Mr Ghosn's pension, thought to be worth €765,000 a year, adding that it reserved the right to bring action against him in the courts. However, in an interview with French TV stations TF1 and LCI, Mr Ghosn - who holds French, Lebanese and Brazilian citizenship - said: "I am innocent. It's hard, I have to admit it, and I call on the French government to defend me, and to defend my rights as a citizen."